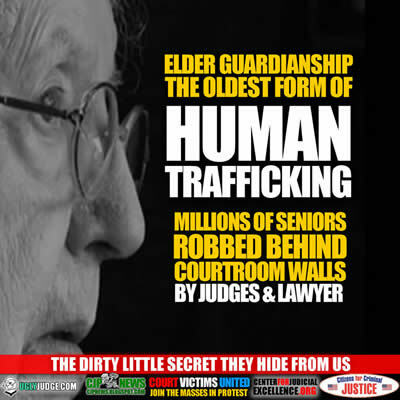 Elder Guardianship is the Oldest Form Of Human Trafficking? The biggest problem in America today is peoiple trusting images. Often the worst criminals, sociopaths, liars and con-artists get away with the use of a FAKE IMAGE. It’s the oldest trick in the book known to some as the “Wolf in Sheep’s clothing”. The problems start when police or authorities believe the better liar or con-artist instead of checking facts and evidence. More often than less Probate investigators fail to check evidence in favor or believeing lies and a more convincing sociopath. Remember the last thing criminals want is you to know what they’re doing or who they really are. For instance when victim came forward with evidence of perjury, elder abuse and fraud the court did nothing, the lawyers all looked the other way knowning that exposing the real criminal means the money train ends. So it continues and the elder abuse is ignored as well as the crimes and violations. The victims are seniors. The partners in crime are financial predators and agents of the Elder Guardianship system — attorneys, professional guardians, medical experts, and others who are paid out of the senior’s assets. There are some good judges but many are overworked and some are actively aiding the exploitation. Anyone can file to deem you incapacitated. The entire process from filing an incapacity petition to plenary guardianship where all rights are removed can happen within days. Yet, once you’re caught in the web, it’s almost impossible to break free… AND you are forced to pay your abusers in the process. A 2013 AARP report gave a “best guess” estimate of the number of adults under guardianship nationally at 1.5 million. Idaho and Minnesota are the only states that track the amount of money being controlled by guardians or conservators; the combined total for just two states is over $1 billion. Guardianship is supposed to protect older citizens. However, what happens when the system is broken? A 2010 federal study by the U.S. Government Accountability Office (GAO) identified hundreds of allegations of physical abuse, neglect and financial exploitation by guardians in 45 states and the District of Columbia between 1990 and 2010. In 20 cases, the GAO found that guardians stole or improperly obtained $5.4 million in assets from 158 incapacitated victims. It’s not just one city or state it’s nationwide, judges being paid off in property loans and lawyers bilking hundreds of thousands in legal fees for doing little to nothing. The truth comes out as they only do this to victims with savings or assets, once sucked dry they all disappear into the dark cracks from which they came. These are the lowest form of scumbag lawyers who steal from grandma and grandpa, They perjure petitions, bribe judges and even come in the form of PVP lawyers who all have the same thing in common. “They hide behind a false image of pretending to help or protect. Most of the judges and lawyers involved abusing these defenseless, helpless and vulnerable victims never see them. They just pretend nothing is wrong while they fill their pockets with the blood money. do nothing to help the statute of limitations run out.